TIGARD — Energy, teamwork, determination. Put them all together, and they can overcome a lot of things — such as a sluggish start and an opposing team's big-time scorer. 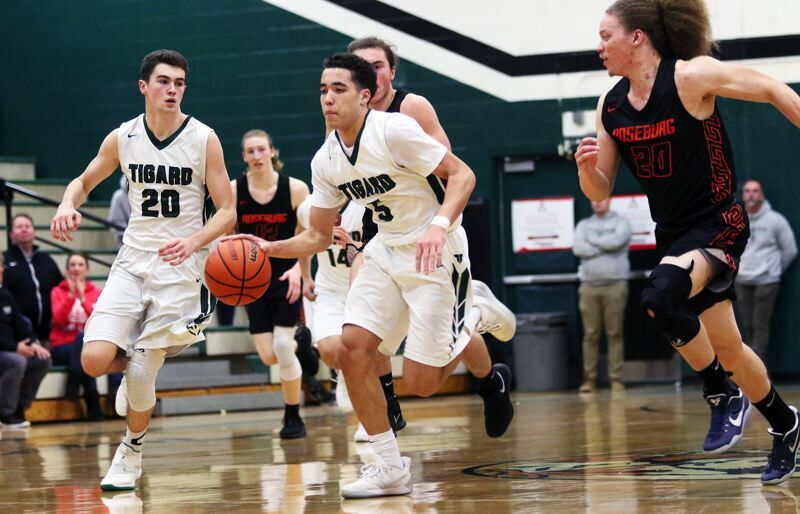 The Tigard High School boys basketball team proved that Thursday night. 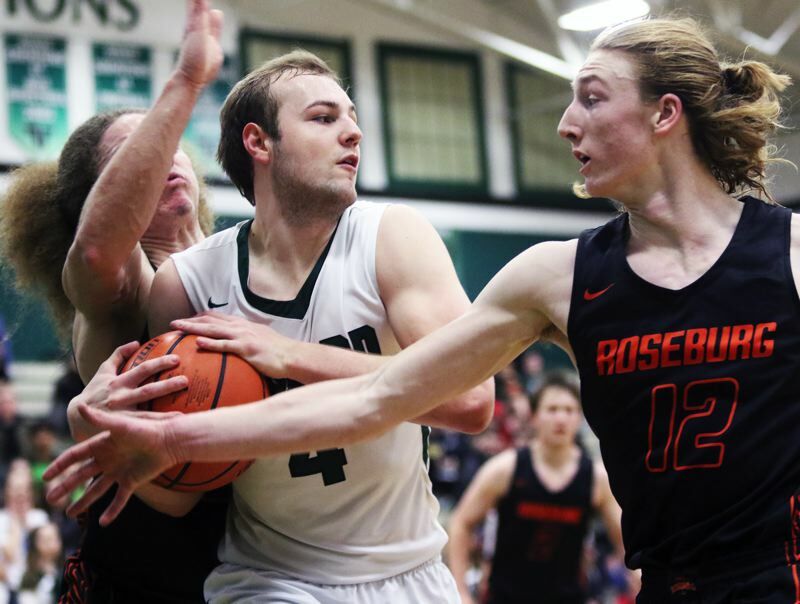 The Tigers, turning up the energy on both ends of the court after trailing early, overcame a 43-point scoring outburst by Roseburg senior Collin Warmouth to get a 72-58 win over the Indians in a Class 6A state playoff first-round game played at Tigard High School. "It went well. 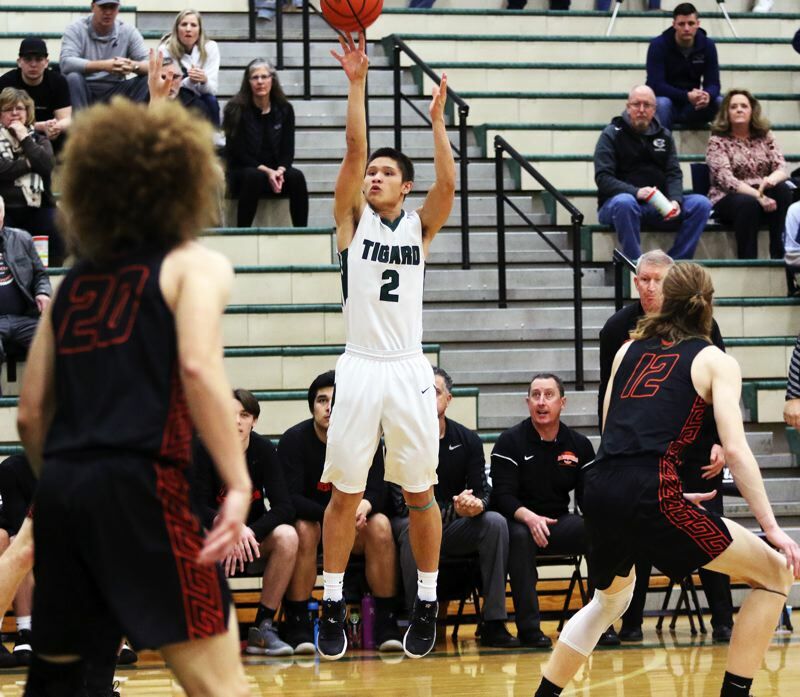 We had a little bit of trouble guarding (Warmouth), but we just had to box out, rebound and make sure to limit everyone else's points," said Tigard sophomore Drew Carter, who scored 19 points in the victory. "We had to pick up our energy and play as a team. We were kind of stagnant, so we had to start moving around." 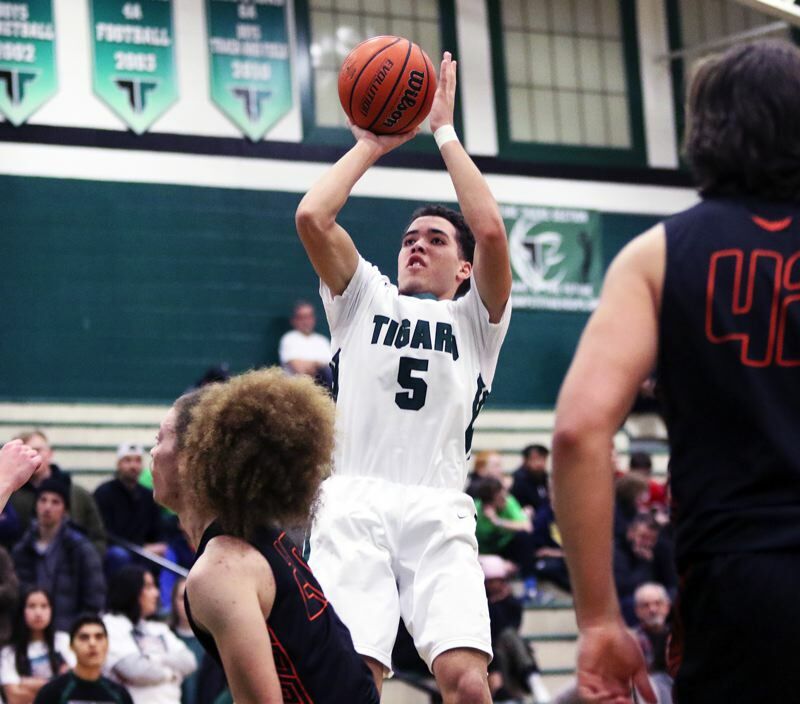 "This feels really good," said Tigard senior Diego Lopez, who scored 16 points. "They're a really good team, with Collin, and everything. This really puts the confidence in us, and gets us ready for Saturday." 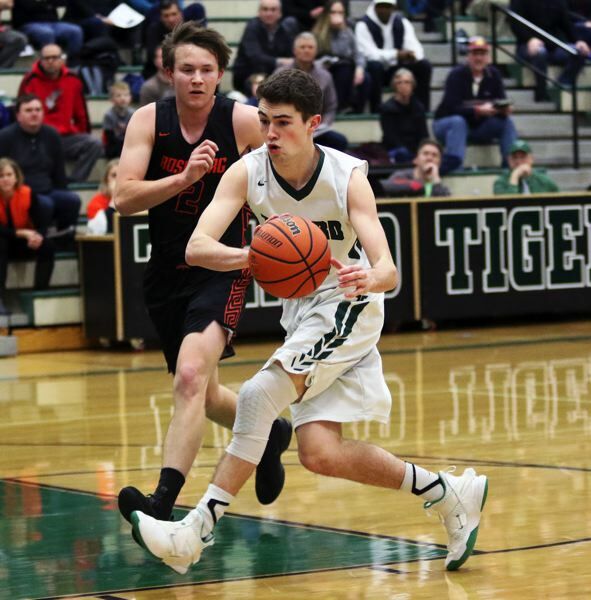 "This is just great," said Tigard junior guard Max Lenzy, who came off the bench to give the Tigers a spark, especially on the defensive end of the court. "We lost the first (playoff game) last year (at McMinnville), so we wanted to prove that we're one of the best in the state. We wanted to come in and compete to win." With the loss, Roseburg, the No. 4 team out of the Southwest Conference, and the No. 26 team in the final OSAA power rankings, finished its season with a record of 15-11. Tigard, the No. 2 team out of the Three Rivers League, and the No. 7 team in the power rankings, improved to 16-9. The Tigers also advance to the second round of the Class 6A state playoffs, where they'll host Barlow in a game set to start at 6 p.m. on Saturday. The winner of that game will advance to the Class 6A state tournament, which starts Wednesday at the University of Portland's Chiles Center. "Our eyes are on the Chiles Center," Lopez said. "It's a big goal for us, and I think we can do it, if we all come together." "That's been our goal since the start of the season," Lenzy said. "We're very determined to get there." Roseburg, behind the play of Warmouth, who was a scoring weapon both inside and out, jumped out to a quick 8-2 lead in Thursday's playoff opener. "Our energy was down, and we recognized it, and we picked it up.," Carter said. "A couple guys on the team said 'hey, we've got to pick it up, our energy's flat,' and we knew we had to turn up the intensity." Lopez helped pick up the energy, scoring five quick, unanswered points. First, he sank a 3-pointer from the left corner, coming off an assist by senior Jazz Ross, then he scored on a layup off a pass by senior Jake Bullard, trimming the Roseburg lead to 8-7. Lopez ended up scoring 10 points in the opening period, with ended with the Indians holding an 18-17 lead. "I had the confidence in my shot, and I was confident in my ability, so I just let it fly," Lopez said with a smile. The energetic Tigers took control in the second quarter. Carter opened the period with a 3-pointer, giving Tigard a 20-18 lead, and senior Stevie Schlabach took over from there. Schlabach scored 13 points in the final 6:18 of the period, helping the Tigers take a 33-27 halftime lead. "Stevie gave us a really big boost, and so did Drew," Lopez said. "That was really helpful." Tigard kept rolling in the third quarter. The Tigers, behind their defense, opened the period with a 10-0 run, which included four points each by Schlabach and Carter, and a follow-up basket by Lopez, giving the home team a 43-27 advantage with 3:59 left in the quarter. 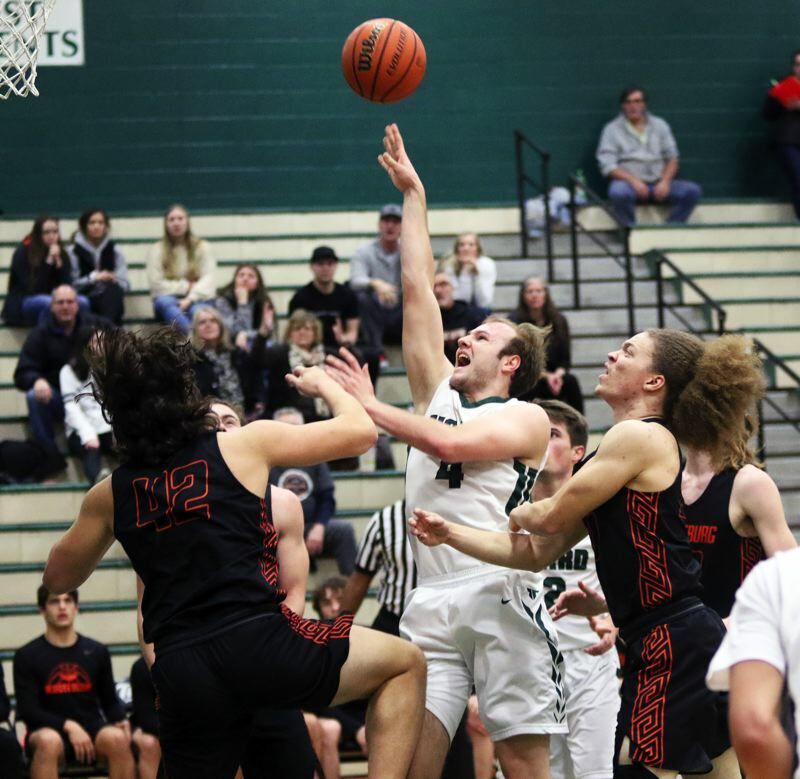 Later in the period, Tigard senior Luke Ness sank a 3-pointer, then he added a layup following a steal and pass by Lenzy, helping the Tigers take a 55-39 lead to the fourth quarter. The sharp-shooting Warmouth tried to get Roseburg back into the game in the final stanza, scoring 15 points in the quarter. 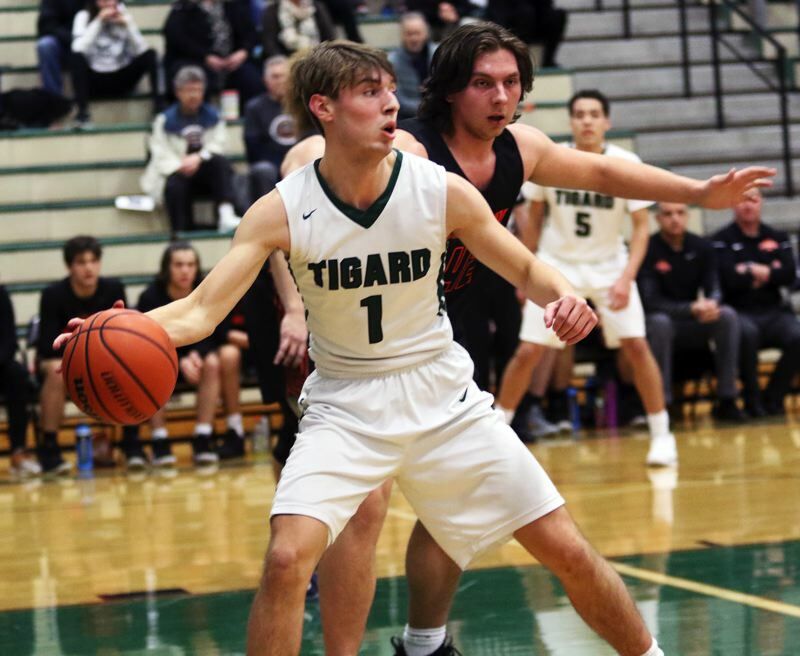 But Tigard, with Carter and Schlabach combining to go 13 for 14 from the foul line in the period, never let the Indians threaten, as the Tigers came away with the 72-58 victory. "We wanted to win, and realized that we had to lock in, and then everything started to click," Lenzy said. "This was great," Carter said. "In the playoffs, you have to take it game-by-game, and we need to keep rolling." Schlabach led the Tigers with 32 points in the victory. Carter had 19 points, including 14 in the second half, while also pulling down six rebounds. Lopez had six rebounds to go with his 16 points. Ness scored five points. Ross had a pair of steals and Bullard had three assists. Tigard, as a team, made 23 of 50 shots from the field, with six 3-pointers, and 20 of 21 free-throw attempts. The Tiger defense also helped force Roseburg into 14 turnovers, while Tigard only had six. "All the credit to Max. He had a great defensive game," Lopez said. "All of us stepped up." "I was just doing what's best for the team," Lenzy said. "That's kind of my role." In addition to Warmouth's 43 points, the Indians also got six points from senior Carson Ellis. Roseburg, as a team, made 23 of 47 shots from the field, with eight 3-pointers, and four of eight free-throw attempts. Barlow, the No. 2 team out of the Mt. Hood Conference, and the No. 10 team in the power rankings, brings an overall record of 18-7 into Saturday's second-round state playoff game. The Bruins, led by junior Jesse White, a state tournament star from a year ago, opened the playoffs Thursday with a 73-63 home win over Sheldon. "Barlow can definitely play, and they have some studs, but we're ready," Lopez said. "I'm excited for it." "We're excited about the next one, but we have to focus up," Carter said. 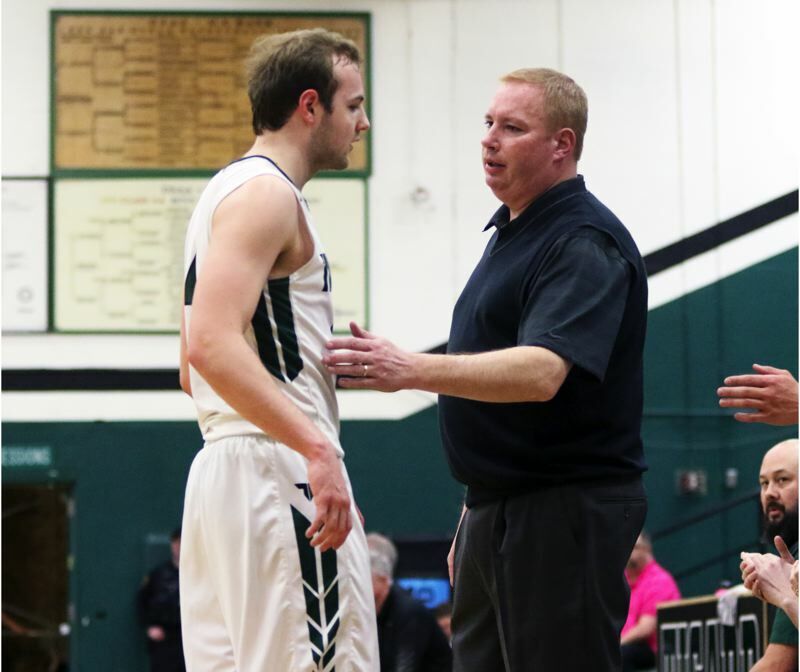 The winner of Saturday's game at Tigard will meet either West Linn or South Salem in a state tournament quarterfinal game, set to start at 8:15 p.m. Wednesday at the Chiles Center.